A warm welcome to Song Bar! Pull up a chair by the roaring fire. Have a hot toddy, or would you prefer a whisky, a brandy, or a gin and tonic, and some ice in that? Here at the Bar we like to choose topics that avoid the obvious, but sometimes the answer is at your feet, right under your nose, and all around you. Is it too obvious, like calling your dog Rover, or you cat Felix (or even vice versa)? But why not, if it works? And if you tread that apparently obvious path, it can sometimes lead to a view and experience that's refreshing and original, a landscape gloriously transformed, just like the best songs can do when they begin with known chords and rhythms. And so that’s where we’re looking this week, for those that refer to ice or snow in lyrics and titles, real or metaphorical, and all that means. It may be a winter wonderland or a dangerous frozen hell – beautiful, brutal, and yet perhaps it might also melt hearts. “The first fall of snow is not only an event, it is a magical event. You go to bed in one kind of a world and wake up in another quite different, and if this is not enchantment then where is it to be found?” says JB Priestley beginning an avalanche of visitors to the Bar, eager to tell us how they view the white stuff. One of snow’s most abiding qualities, says the collective voice, is how it brings us together. “Snow provokes responses that reach right back to childhood, “ says the artist Andy Goldsworthy. “A snowball in the face is surely the perfect beginning to a lasting friendship,” says Markus Zusak in The Book Thief. Ah yes, that take me back. Snow is one of the most inspiration sights for poets, novelists and also for songwriters because of all that it can mean. “The Eskimos had fifty-two names for snow because it was important to them: there ought to be as many for love,” says Margaret Atwood, who quite possibly inspired Kate Bush. While falling it hides your passage /When finished it documents your path,” says Richard L. Ratliff. “Advice is like snow - the softer it falls, the longer it dwells upon, and the deeper it sinks into the mind.” says Samuel Taylor Coleridge (or is that ColdRidge?) calmly emerging from his Kubla Khan ice palace. “Inner peace is a quiet evening moonlight walk in the soft falling snow of our minds,” adds writer Wes Adamson. Ice in many ways is even more extreme than snow, both in associations of beauty, but also danger and death. 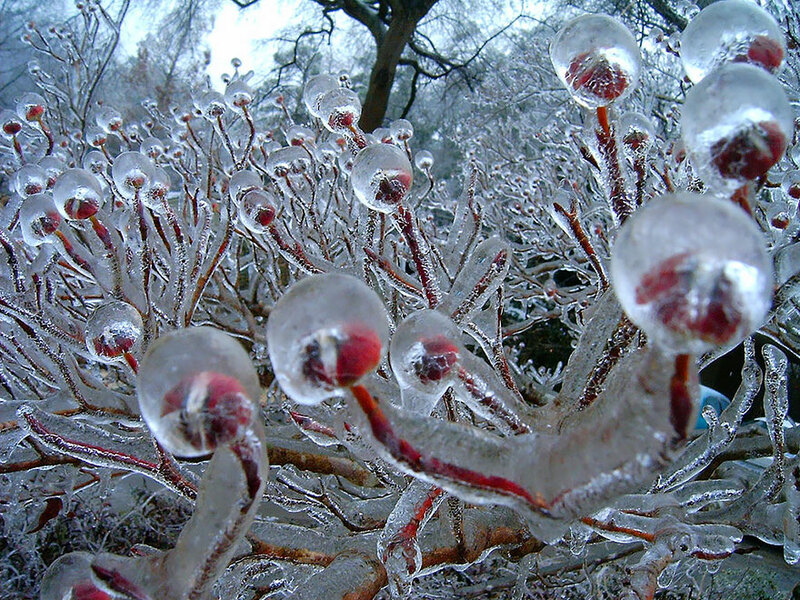 “Some say the world will end in fire, some say in ice,” says the poet Robert Frost. The world. “Ice can kill as dead as fire,” says George RR Martin, enjoying a whisky with ice by the fireside. He’s quoting from A Clash of Kings, one of the books from A Song of Ice and FIre, on which Game of Thrones is based. When Ronald Reagan became US president and promised to make America great again, the comedian Robin Williams commented: “I believe Ronald Reagan can make this country what it once was... a large Arctic region covered with ice.” A similar message, but in a melting to water context, could apply to Donald Trump. “Civilisation is like a thin layer of ice upon a deep ocean of chaos and darkness,” says the film-make Werner Herzog, darkly. We may well be heading for that iceberg, like the Titanic. Ice of course has many other connotations, not merely in bar scenes with ice cubes, as well as ice palaces and hotels and amazing art, but also in terms of emotions. “You've got ice in your veins, but you're smart enough to keep it from freezing your heart.” says Tijan, in the book Sentiment Lost. “There is a fun, flippant side to me, of course. But I would much rather be known as the Ice Queen, says Siouxsie Sioux, warmly. What’ll you have, Siouxsie? It’s on the house. So we can also expect quite a few icy emotion songs too. So then, serving up plenty of ice at the Bar, sheltering you from the snowstorm and the cold, and tending to your every frozen and melting needs, I’m delighted to welcome as this week’s guru, the terrific takeitawayGuru. Place your snow and ice songs in comments below for deadline last orders o Monday 11pm UK time, for playlists published next time. I imagine there may be a blizzard of nominations, but the result will be beautiful.